The LVJ Summer Institute brought librarians from La Salle University, Villanova University and Saint Joseph’s University to Saint Joseph’s campus on July 18, 2012, to discuss the latest in technology, physical space and trends in academic libraries. Falvey staff played an active role in LVJ 2012. 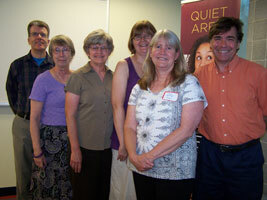 University Librarian, Joe Lucia, and members of the Communication and Publications team each gave presentations. The afternoon session began with a “Marketing Update and Idea Swap,” in which Falvey Memorial Library’s Communication and Publications team explained the team’s various activities. Gerald Dierkes, senior copy editor, provided a brief history of the library’s various communi-cations outlets, culminating in Falvey’s blog. Alice Bampton—people, Special Collections, exhibits and photography— explained the process for reporting on exhibits and events. Laura Hutelmyer, photography coordinator and features, discussed images and photos, as well as the Library’s newsletter. Luisa Cywinski—services, policies, online publishing and newswires—described Falvey’s use of social media. Joe Lucia outlined the goals, challenges and benefits of creating Falvey’s Learning Commons. In the morning, Robert J. Lackie, MLIS, MA, presented “Protecting Your Digital Footprint at Work, Home and on the Road: 15 Tips on ID Theft in 60 Minutes.” Lackie is a professor and librarian at the Moore Library at Rider University. After a lively question and answer session, participants enjoyed lunch and tours of the Post Academic Center. Completed in March 2012, the 35,000-square-foot, three-story addition to Saint Joseph’s Drexel Library illustrates the epitome of 21st century academic libraries. In addition to Lucia and members of the Communication and Publications team, several other Falvey librarians attended this year’s LVJ event. LVJ (La Salle, Villanova, Saint Joseph’s) is almost ten years old. Joe Lucia initiated it, working with John Baky, director of libraries at La Salle, and Evelyn Minick of St. Joe’s. LVJ meets each summer. It is designed to provide librarians and staff from the three universities an opportunity for professional development. Barbara Quintiliano has also been instrumental in leading and organizing LVJ. And she took this photo also.